Posts Tagged "hair care in summer"
1. 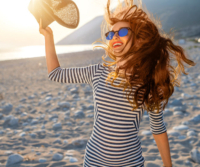 If you are going to spend a lot of time in the sun this summer, we recommend either applying a deep conditioner containing SPF protection or covering your scalp with a hat. Also, Skip the hot tools. You should also avoid heat styling as much as possible. At least a couple times a week, give your hair a break from blow dryers, flat irons, and curling irons. Avoid brushing your hair when it is frizzy and tangled. The best time to comb is after conditioning, after your hair has dried; as hair is much more fragile when it is wet. 2. If you are going to spend a lot of time in the pool, the trick to avoiding the greenish color and chlorine damage is to prep your hair before swimming. Dry hair can actually acts like a sponge; therefore you should rinse your hair with tap water before your swim in order to ensure it will absorb significantly less chlorine. After swimming, try rinsing your hair with some apple cider vinegar and water to help offset the chlorine damage. 3. Kerastase Treatments can help revitalize and rehydrate your hair, bringing it back to life. Kerastase offers in salon and homecare programs to meet the needs of every hair type. The nourishing active ingredients immediately deliver visible results that leave the hair in immaculate condition, with texture and shine. 4. Wash your hair less. Frequent washing strips your scalp from its natural oils, stimulating an additional production of oil. On break days, make sure to rinse your hair with cold water since it closes the cuticle and seals its moisture. 5. Avoid tight pony tails or buns that can break your hair that’s already damaged due to the summer heat. If you want to keep your hair off your neck, try other hairstyles like a loose braid or low bun. Another option is to get a little daring and try a summer short haircut that’s easy to maintain. 6. Stay hydrated. Water important for our health and our hair as well, especially during the hot summer days. Water helps cells grow and transport much needed minerals. Good hydration also ensures that hair stays hydrated and healthy, preventing drying of the scalp and potential dandruff problem. Christie Adam is a full-service salon and spa established in 1999 in Great Falls, Virginia. It soon became one of the premier hair salon and spas in Northern Virginia. Over the years, we have continued to grow and are always on the cutting edge of new trends in the industry. Contact us today to learn more about protecting your hair in the summer.